Style is not eternal. It’s hard to believe that my own beautiful, pricey granite kitchen counters installed in 1999 are now considered passe. This does not mean that I am tacky. It means that this part of my house looks dated. I’m not the only one. With the lingering recession, many remodeling and redecorating projects are on hold and we are living the “as-is” lifestyle. Benign neglect makes that giant whitewashed armoire or faux-finished ceiling that was once on the cover of Elle Decor your own personal monument to decades past. Compare your interiors to a clothes closet that is never weeded out. From time to time, rooms need a fresh eye and a wardrobe change. Home fashion repeats itself but rarely in the exact same way. Elements come back in slightly different forms. Wall-to-wall shag was the toast of the 1970s. In the past decade, shag area rugs have become a designer showhouse staple. Avocado-green walls were pretty much banished after the 1970s, but olive green is having a revival as we speak. Anyone who spends time dropping in on open houses in their neighborhood knows that many homes, with their puffy balloon shades and sloppy slipcovered sofas, are stuck in another decade. So remember that the orange, gourd-shaped lamp you think is so chic may have no takers on Craigslist in 2020. In the spirit of fun, we asked a few local designers to come up with a list of the seven deadly sins of dated decorating and how to fix them. How many will you confess to? Mauve was big in the 1980s and 1990s, when the distinctive dusty rose color showed up on carpeting, sectional sofas and especially accent walls. If your bedroom is painted mauve, you are sleeping in a time warp. Designer Amy Zantzinger thinks lots of living rooms need an overhead lighting overhaul. “Track and recessed fixtures interrupt a beautiful ceiling. They are overdone and look tired,” she said. “Track lighting is also bulky and clunky, cluttering up your ceiling.” Zantzinger also says ceiling-mounted lights are unnecessary to highlight your paintings. “I don’t live in an art gallery,” she said. Zantzinger believes that floor lamps are making a huge comeback. She likes a combination of floor and table lamps to personalize a room. Some of her favorite floor lamps are skinny metal ones that give an overall glow and add height to a room. She likes those from Holtkoetter.com, especially the floor lamps with a small metal shade. Remember when huge roll-arm sofas upholstered in bold floral prints were a mainstay in living rooms? Fabric in dramatic patterns isn’t generally a wise investment, said Erin Paige Pitts , a designer based in Gibson Island, Md. If you went on vacation to Tuscany or Oaxaca, fell in love with vivid tiles and installed them in your kitchen or bathroom 20 years ago, it’s time for a change. 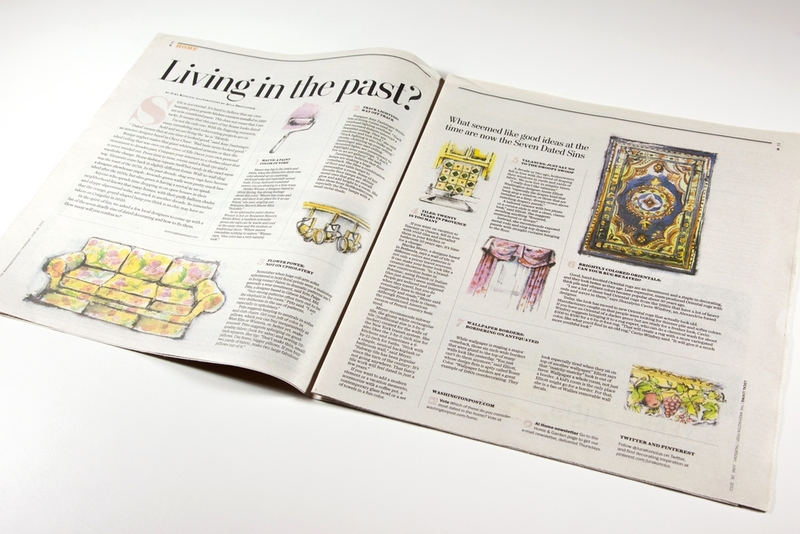 Marika Meyer, a designer based in Bethesda, says a wall of tile in different colors and patterns is not only a pricey travel souvenir, it can make your home look like a ceramic showroom. “In a brand-new construction home in Potomac, using French or Italian tiles just doesn’t seem authentic. People get seduced and inspired when they travel, but you do eventually have to think of longevity and resale,” Meyer said. Although French style is classic, the romanticized American version of French country feels tired. If you want to add a modern element or a vacation memento, accessorize with a coffee pot, a contemporary glass bowl or a set of towels in a fun color. A decade or two ago, homeowners fell in love with the trend of draping their windows in yards and yards of fabric. We now live in simpler times. Instead, she recommends exposed metal rods and ring-top drapery panels with straight curtains hanging to the floor. 6. Brightly colored Orientals: Can your rug be saved? Good, hand-knotted Oriental rugs are an investment and a staple in decorating, and they look better as they age. Less expensive, mass-produced Oriental rugs with thick pile and vibrant colors became popular about 30 years ago. “I see a lot of these bad Oriental rugs from the 1990s that have a lot of heavy reds and navys in them,” says Shazalynn Cavin-Winfrey, an Alexandria-based designer. While wallpaper is staging a major comeback, those six-inch-wide borders that were glued to the top of many walls look like yesterday. “You just can’t do them anymore,” said Elliott, whose design firm is aptly called Bossy Color. “Wallpaper borders are a great example of 1980s overdecorating. They look especially tired when they sit on top of another wallpaper.” Elliott says that “matchy-matchy” look is out of favor. Wallpaper a whole room, not just a border. A kid’s room is the only place Elliott might go for a border. For that, she is a fan of Wallies removable wall decals. View the article on the WashingtonPost.com.